Welcome to our Tulare FFA website! We are proud to provide a useful platform where you can stay up-to-date and informed about our extraordinary FFA program and activities. The Tulare FFA students are committed to agricultural education and are proud knowing they are part of something so vital to the Tulare County livelihood - Tulare County’s total gross production value for 2014 was $8 billion. 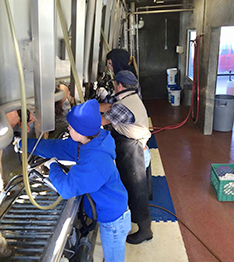 Milk continues to be the leading agricultural commodity in Tulare County, with a total gross value of $2.5 billion. Our impressive living lab allows students the opportunity to experience, from the ground up, what these statistics really mean for our community and the nation. The Tulare FFA students are dedicated and hard working. We realize no student is success alone, and we recognize the commitment of our parents and thank them for their continued support of their children and the Tulare FFA program. For more information on the Tulare FFA program or on how to become involved with the program, please call the Tulare High School Farm office at (559) 687.7390.